Tennessee with its own pick lands here at 18. Addressing defense with the LA Rams pick earlier, now they can add a weapon for Marcus Mariota. QB and RB are in place, being able to add a top caliber receiver to the mix should make the Titans a team to be reckoned with in the AFC South. Tennessee had the same record as the division winning Texans, but lost out on tiebreakers. If they hit on both of these first round picks, barring a significant injury, this is the team of the future. Corey Davis is a big target at 6’3″ 209. Virtually the same size as Clemson’s Mike Williams. Davis leaves college football as the all time leader in receiving yards from major colleges and is the 2016 Mid America Conference Player of the Year. He will be an ideal redzone target because of his jumping and timing, especially for 50/50 balls. He will likely have to shore up his route running, and he was not asked to do any meaningful blocking while in college. But these should not hold him back from getting on the field quickly. 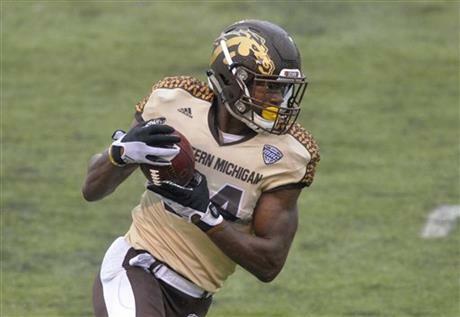 With pick 18 the Titans will take Corey Davis, WR, Western Michigan.